I’d had a conversation with someone, the other day, about how people in the UK seem to have some sort of emotional barrier to routinely dining in hotel restaurants, other than when they’re staying in that hotel. 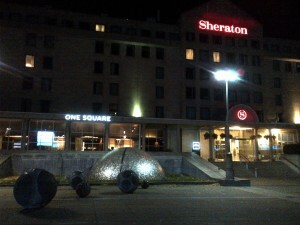 With this fresh in my mind, I thought a trip to One Square, the restaurant at the Sheraton, was in order. I was delighted to cross the threshold of a hotel whose construction I can remember observing daily, as I walked to and from school, many years ago. This was far from my first visit to the place, but I don’t think I’d visited for a good wee while. I digress. Looking out over Festival Square, the dining space within the hotel is as smart as you would expect. It radiates assured elegance. I was greeted by a friendly front of house manager, who showed me to my table, then passed over my care to a lovely waitress, who guided me through food and drink decisions with a diffident charm. The menu has the feeling of something that’s seeking to cater to all tastes. It showcases Scottish produce, to the fore, but has plenty to please broader needs. I took a while to select, as I sipped a pre-prandial sherry, but eventually I settled upon the mussels and clams to start, followed by the flat iron steak. I should probably declare that these choices were probably not the most judicious, as a few days before this visit, I’d spent time in the Nira Caledonia, where their mussels and steak had been stratospherically good. 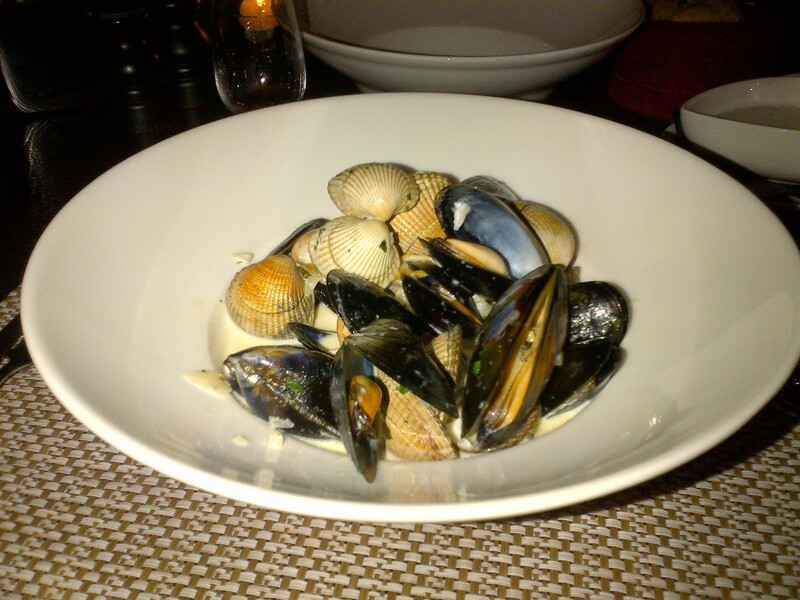 Come to think of it, I’d had damn good clams at Positano, recently, too. It’s a credit to One Square that I enjoyed both dishes that they served me, in spite of these misty-eyed memories. First up was the seafood, which was just lovely. Beautifully prepared clams and mussels were steeped in a wonderful creamy broth. I gobbled the lot and the soupy goodness of the liquor, too. The main course steak was prepared to a very similar level of precision. 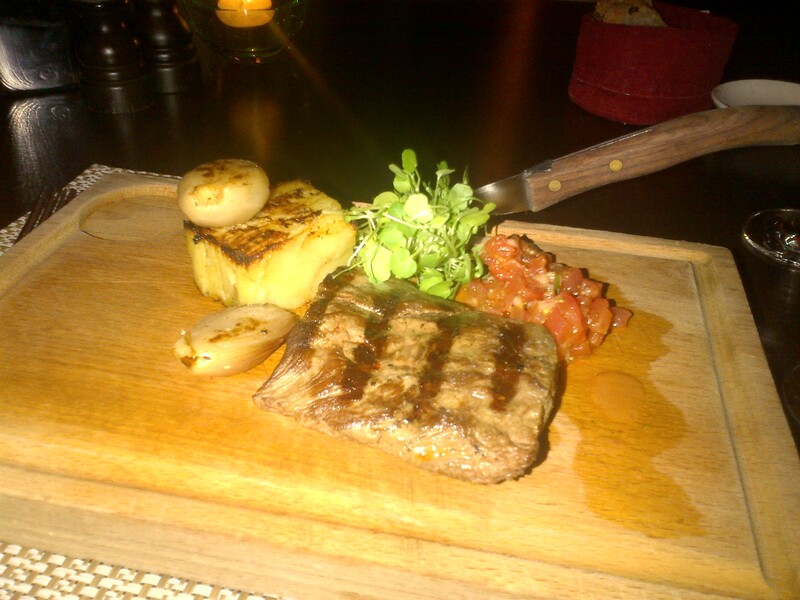 It was wonderfully tender, but paid a little for that tenderness in a slight lack of flavour. It was a steak ideally suited to a good sauce accompaniment, but MJ has trained me out of ordering sauces with steak, so I didn’t see it to its best advantage. For dessert, the usually simple choice of “cheeseboard” was somewhat complicated by there being two options. After consultation with my ever helpful waitress, I opted for the blue cheese “flight” over the regular selection of cheeses. 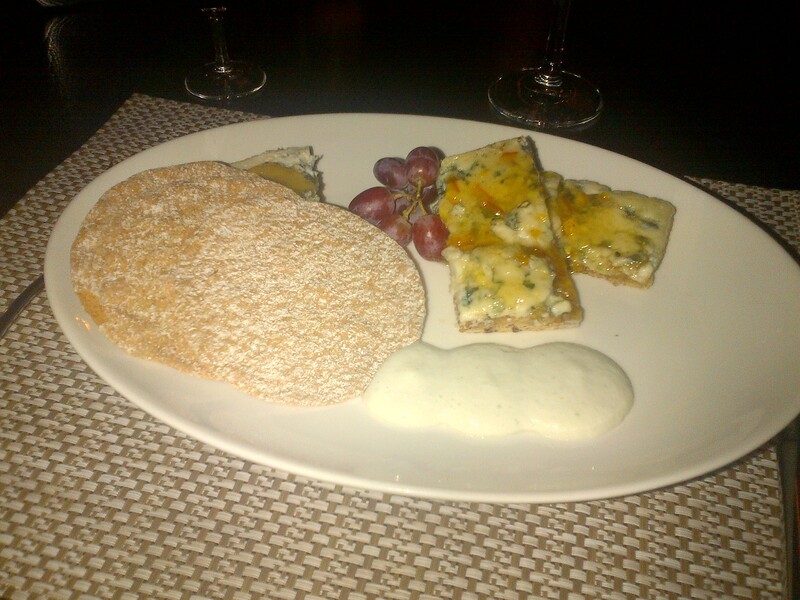 This proved to be excellent choice, with good crispbread served with a honey-topped blue cheese wedge, a delightful marmalade and blue cheese on toast, then a blue cheese foam. It showed flair and imagination that was only hinted at in the more restrained starter and main course. So overall, I enjoyed my visit to One Square. There’s a lot to like about the menu, and I was impressed with my dishes. I’d recommend One Square as a place to visit, as there is undoubted quality on offer, in very stylish surroundings.